This entry was posted in Blog News News: Full Lowdown News: Politics Video and tagged blog news News: Full Lowdown News: Politics video on October 15, 2014 by Tom Grundy. An Umbrella Movement video explainer by Anthony Amici. This entry was posted in Blog News News: Full Lowdown News: Politics Photography & Wallpapers and tagged blog news News: Full Lowdown News: Politics Photography & Wallpapers on October 15, 2014 by Tom Grundy. A HongWrong.com / Huffington Post cross-feature. 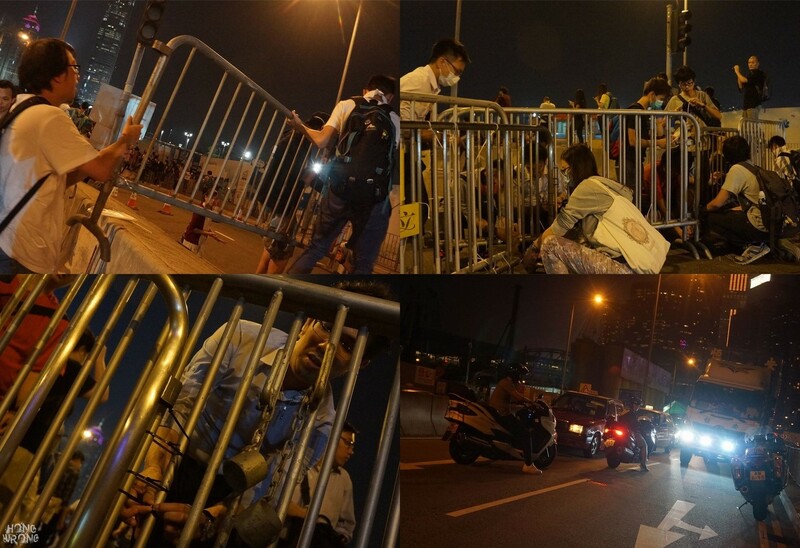 At around 9:40pm last night, a small group of Umbrella Movement activists dragged metal barriers on to Lung Wo Road at the rear of government headquarters. The area near the main Occupy camp was previously open to traffic. But after some debate, a small group of demonstrators moved in to block the road. With fewer than a dozen police officers on the scene, pro-democracy protesters reinforced barriers on the eastbound side of Lung Wo Road with cable ties. The move came after police cleared an area of barricades at the southern end of the main protest site earlier in the day. This entry was posted in Blog News News: Full Lowdown News: Politics Photography & Wallpapers and tagged blog news News: Full Lowdown News: Politics Photography & Wallpapers on October 9, 2014 by Tom Grundy. A special Hong Wrong/Huffington Post cross-feature. 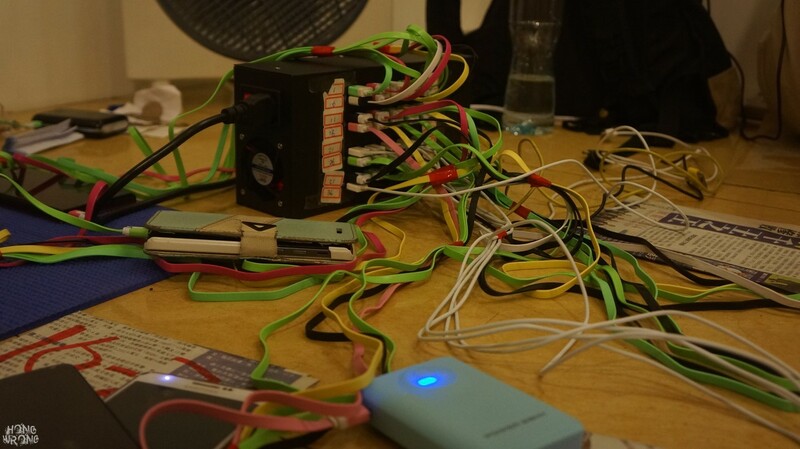 Sirius Lee (his real name) has few concerns over the safety of the crude-looking, 40-socket USB charger he purchased for HK$500 from the mainland. The contraption sits in a mesh of cables at a mall near the main Occupy Central protest camp in Admiralty. Over the past week, over 2,000 people have entrusted their phones and tablets to 22-year-old Lee and his team of 30 friends, who man the “Recharge Corner” in shifts. Should the police move in, Lee’s team can escape rapidly into the metro system after pulling down an “emergency sign” that tells people who to contact to retrieve their phones. Smartphone-addicted Hong Kongers at the protest camp are so grateful for the free service, they have given food and chocolates to the team. The only hostility they have experienced so far is from an anti-Occupy Central activist, wearing a facemask, who emerged from the metro and began heckling them. But Lee was prepared. “We sang the Happy Birthday song… It is one of our strategies to confuse those people!” he said. It worked. The baffled agitator left in embarrassment. This entry was posted in Blog News News: Full Lowdown News: Politics Photography & Wallpapers and tagged blog news News: Full Lowdown News: Politics Photography & Wallpapers on October 5, 2014 by Tom Grundy. Part two. See part one here. Trouble-makers and Occupy Central protesters requesting to leave were escorted away from the site. Counter-protesters jeered and lashed out at them. On one occasion, police removed a rowdy anti-Occupy protester, placing him back on the front lines moments later. For full galleries, see Hong Wrong on Global Post or Vocativ. This is part one, part two here. On Friday, hundreds of anti-Occupy Central thugs stormed through the pro-democracy protest camp in Mong Kok, vastly outnumbering police who struggled to maintain order. To see how the night unfolded, in detail, see Twitter. 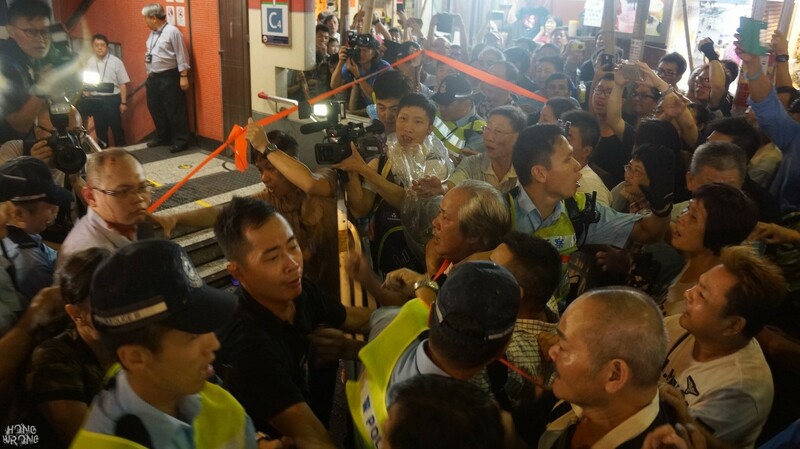 Tents were torn apart, supply stations destroyed, placards were ripped down and brawls broke out as the mob tore through the encampment at the junction of Argyle Street and Nathan Road. This entry was posted in Blog News News: Full Lowdown News: Politics and tagged blog news News: Full Lowdown News: Politics on August 18, 2014 by Tom Grundy. Thousands of protesters occupied Central in a rally against the pro-democracy Occupy Central movement yesterday. However, Now TV, Cable TV, TVB, Oriental Daily and the Economic Journal each discovered instances of demonstrators being paid up to HK$480 or offered freebies to attend. via Aaron Anfinson for Hong Wrong. Many attendees had been mobilised by ethnic groups, leftist organisations, pro-government political parties and even businesses. 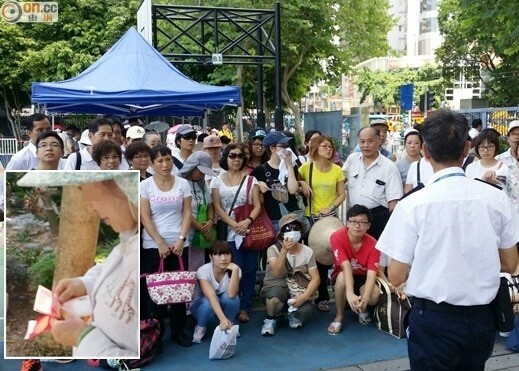 Oriental Daily uncover protesters being handed cash at the pro-government rally. Police said that 110,600 attended – more than their estimate for the July 1st pro-democracy march, which they put at 98,600. 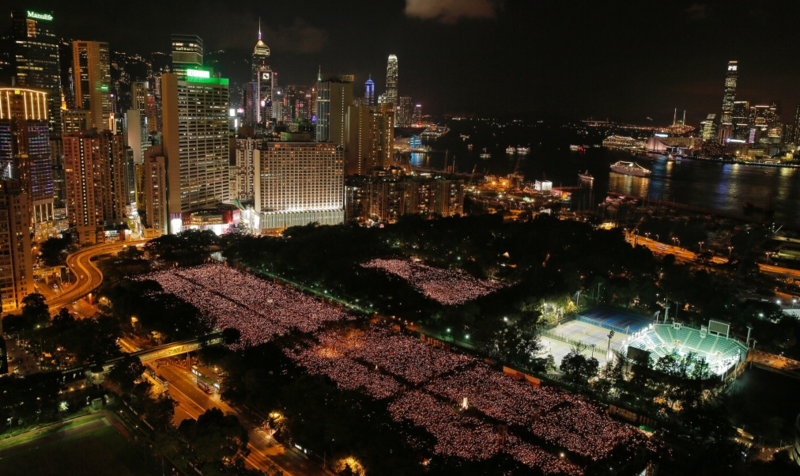 HKUPOP estimated that 79,000-88,000 attended whilst organisers claimed 193,000 took part. A single SocREC reporter conducted a nonstop headcount, estimating a turnout of 41,250. This entry was posted in Blog News News: Full Lowdown News: Politics and tagged blog news News: Full Lowdown News: Politics on July 1, 2014 by Tom Grundy. Organisers say 510,000 people rallied for full democracy on the streets of Hong Kong Island today. Demonstrators assembled in Victoria Park at 3pm and headed peacefully down Yee Wo Street to Hennessy Road and on to Statue Square in Central. This entry was posted in Blog News News: Full Lowdown News: Politics and tagged blog news News: Full Lowdown News: Politics on June 4, 2014 by Tom Grundy. 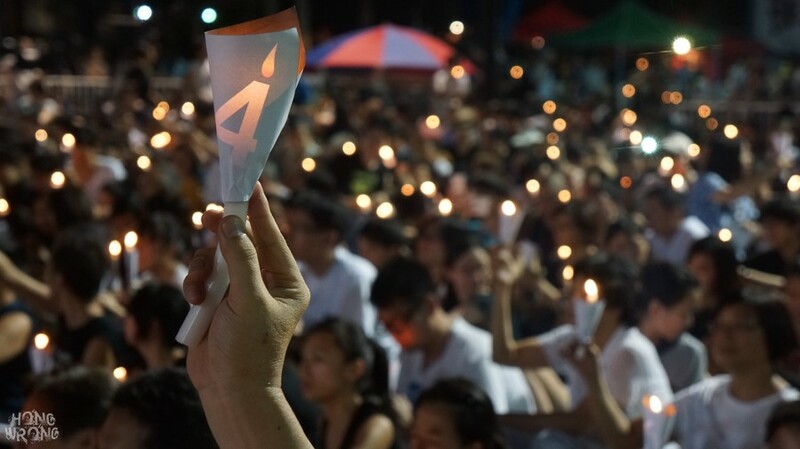 Organisers say over 180,000 Hong Kongers gathered this evening in Victoria Park and to commemorate the victims of the Tiananmen Square massacre. Despite the humid weather, it was a record turnout as attendees, listened to speeches, sang songs, watched videos of people recalling their experiences and took part in a moment’s silence to remember the dead. Wearing black and holding candles, they filled six soccer pitches. This entry was posted in Blog Interview (#NoFilter) News News: Full Lowdown News: Politics and tagged blog Interview (#NoFilter) news News: Full Lowdown News: Politics on May 26, 2014 by Tom Grundy. The basics: Who is behind Occupy Central? What are its aims and how did we get here? Beijing’s response: How does the movement fit in with Beijing’s own idea of ‘universal suffrage with Chinese characteristics’? Methods: What does the complicated deliberation process entail? Does Benny have a personal preference for an election model? And how does HK’s situation compare to Taiwan’s recent occupation protest? Media coverage: Is there a conscious effort to smear the campaign? How valid are the predictions of violence and accusations that the proposal is ‘illegal’? English captions are embedded in the video above. You can also stream an audio version below. This entry was posted in Blog News News: Full Lowdown News: Politics and tagged blog news News: Full Lowdown News: Politics on May 13, 2014 by Tom Grundy. ‘Occupy Central with Love and Peace’ (unrelated to the ‘Occupy Wall St’) is a proposal by pro-democracy activists to take over Central as a non-violent ‘last resort’ measure to demand one-person-one-vote. 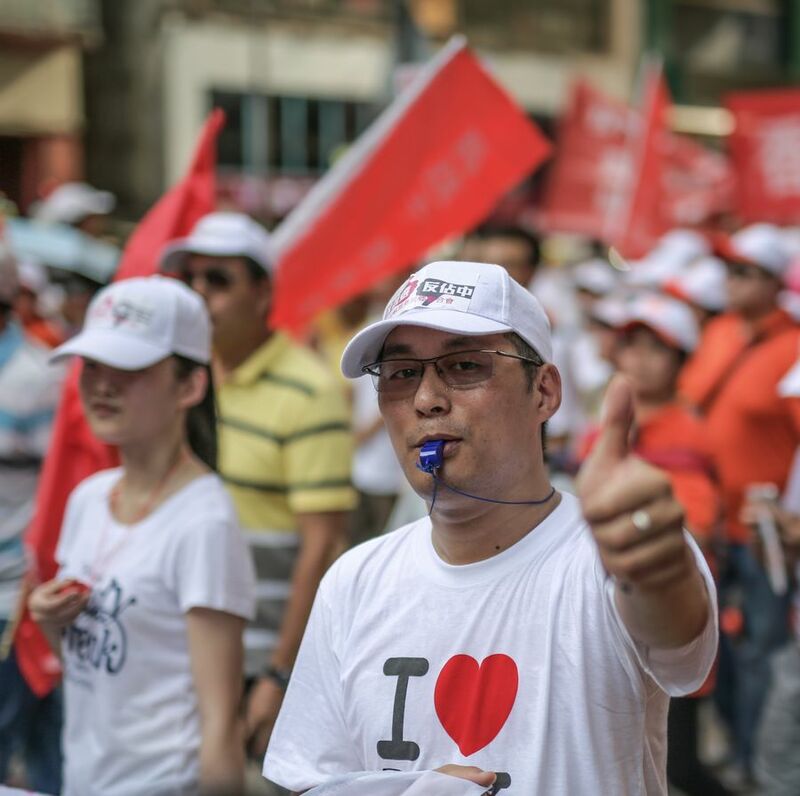 The idea was popularised last year after leaders in Beijing stated that any future HK leader must pledge to ‘love both the country and Hong Kong’. By March 2014, China had ruled out full democracy stating that citizens will not be able to choose candidates. The article below is adapted from a Op-ed by Hong Wrong featured in the Ming Pao over the weekend (original English version here). Only in Hong Kong could one spend 18 months debating a protest. This is Protest City where there are hundreds each year, on every topic, often with accompanying counter-protests and protests to counter those counter-protests. They are usually formulaic but they come in all sizes. Some are angry, some are solemn; some take the form of hurling hell money or fruit around LegCo whilst others involve of thousands of Hong Kongers surrounding government headquarters forcing leaders to pay attention. One thing, however, that unites post-colonial protest culture is how consistently peaceful such gatherings are. 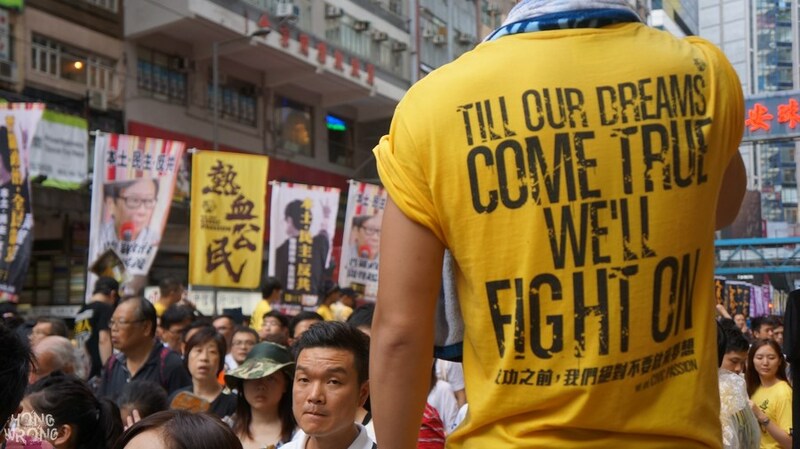 Having witnessed the city’s strong tradition of nonviolent dissent from the frontlines over the past 9 years, it is obvious that Occupy Central should be no different. For people such as C. K. Chow, chairman of the Chamber of Commerce, to suggest otherwise amounts to alarmist hysteria. Occupy Central organisers, Reverend Chu Yiu-ming, Dr Benny Tai Yiu-ting, and Chan Kin-man.